Let’s say you’re just starting out with essential oils. I want to welcome to the wild and wonderful world of oils. You’re going to have a lot of fun. There’s no doubt that getting started can be a little confusing considering the wide variety of essential oils available and their many benefits and uses, though. That’s what we’re here for. In this post I am going to cover the basics of essentials oils, how and why people use them, some safety aspects and some of my favorites to try out. Next week’s post will cover our top 10 essential oils for your home kit, and I will go into more detail about the benefits and uses of each of those. Before we get started, I wanted to tell you about some great learning resources out there. While we can give you a pretty good overview of what essential oils can do for you and your health, this topic is HUGE! 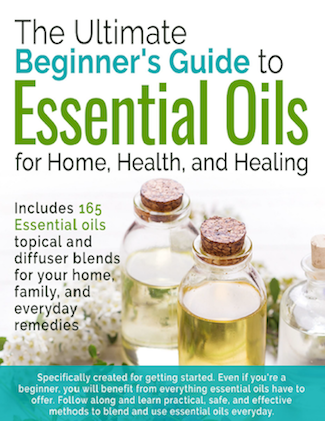 Then grab your copy of The Ultimate Beginners Guide to Essential Oils that will teach you everything you need to know about oils. You will learn best safety practices, over and uses, how to build your own essential oil toolkit, and recommended companies you should buy your oils from. Today, we’ll be briefing you on the beginner’s guide to using essential oils effectively and safely, discussing some of the primary uses, how to purchase quality oils, and anything else you might want to know before you get involved. An essential oil is simply the oil extract from a plant, or technically speaking, a concentrated hydrophobic liquid containing volatile aroma compounds from plants. They’ve been used for thousands of years for therapeutic and medicinal purposes. If you think about all of the healing and therapeutic benefits of herbs and plants, it’s no surprise that their derivatives are equally advantageous for health and household use. If you’ve admired the sweet aroma of your favorite flower, you’ve essentially already taken advantage of essential oils. Over 3,000 volatile compounds have been identified, but what exactly is that? Well, a volatile compound is quite simply a compound that changes states very rapidly, meaning it will transition from solid or liquid to gas at room temperature. This explains the potency of the smells given off by essential oils. You’ll notice upon opening a bottle that you get a whiff almost immediately. These volatile compounds allow that aroma to be carried efficiently around the room which is why essential oils are popular for aroma therapy. If you can imagine the process of growing any plant or crop, you can probably identify quite a few factors that give it its unique properties: climate, time of year grown/harvested, location, method, and more. These will also influence the quality and oil composition of any essential oil – even those that are labelled pure. This is something to keep in mind, and above all, encourage you to choose quality essential oils every time. Each essential oil contains its own unique set of benefits which we’ll discuss further in our most essential essential oils post. To get started, we’ll discuss some of the properties that most essential oils contain, giving you a better idea of why exactly they’re used for so many healthful and practical uses. Antimicrobial, antibacterial, antifungal, antiseptic and antiviral. These properties make oils suitable for fighting infections, cleaning, hygiene, and more. They are relaxing. Oils are great for everything from aiding you in getting to sleep at night to using as a salve on sore muscles. Naturally nourishing for the skin. Oils can be used for everything from dandruff to acne scars to stretch marks making them a must-have for natural skincare. Non-toxic cleaning. Many scented (and unscented) cleaning products are toxic and hormone-disrupting. Essential oils will keep your home fresh-smelling and clean while actually helping to balance out your hormones. Inflammation management. Many essential oils have the capacity to fight inflammation which leads to better digestion and reduced pain. Strong immune system. Some oils are great at stimulating the immune system helping you to prevent and overcome illness. Why might you want to start using oils? Well, we have quite a few convincing reasons. Considering the wide range of uses, there isn’t a single person who couldn’t have at least a few favorite bottles lying around the house. You can always mix essential oils into oil and water for skincare and household cleaning purposes! Aromatherapy. Simply put, breathing in the relaxing aroma of something like tea tree oil or lavender oil is a great way to relax the body and mind. It couldn’t be simpler, either; a diffuser does the work for you. Just add a few drops throughout the day and let it infuse the room. It’s a safer and less overpowering way than most candles to scent the room, plus you can set it and forget it, making it safer. Cleaner air. Many essential oils contain antimicrobial properties, so diffusing them can actually purify the air. Household cleaner. Many essential oils also have antibacterial properties, so you can add a few drops to water for a natural and non-toxic disinfectant. Wash your clothes with it. Considering its powerful ability to get things clean, your clothes are no exception. Many commercial detergents contain very harsh chemicals and scents, so adding 20-30 drops of essential oils to your load in place of scented detergent will still give you that fresh clothes feeling without the irritation. Calm down. Oils like lavender oil are naturally relaxing, helping you to eliminate anxious and nervous thoughts. It can also be a useful natural sleep supplement helping you to wind down at night. Freshen up the house. Stinky garbage cans got you down? Adding a few drops to the bottom of receptacles or non-ventilated areas can help prevent odour build-up. This also works for shoes. Pest repellent. Quite a few essential oils work as a bug repellent on the body while others are good for deterring mice and rodents from your house. DIY spa treatment. Add some to a face mask, whip up a homemade body butter, or simply add a few drops of your favourite scent blend into a bath for a relaxing at-home spa treatment. Basic hygiene. Because of the antimicrobial properties, it makes a good cleaner for the body. From adding some to homemade toothpaste or swishing some peppermint oil, to using oils in your face wash or shampoo, they can help keep you naturally clean. Natural perfume. We all know someone whose perfume gives us an immediate headache or causes us to sneeze! Essential oils provide a gentle, lasting smell instead. Simply dilute with water and use as a daily spray or dab a drop under the ears/on the neck to find your signature scent. Skin care. We have to take care of our body’s largest organ! Some essential oils are great for using as a toner, an anti-ageing agent, healing dry skin, and even helping to reduce the appearance of stretch marks. Wound healing. Once again, essential oils’ antibacterial properties come in the clutch. Some oils can be used for burns, bug bites, and generally speeding up the healing of small wounds while avoiding infection. Respiratory health. Breathing in some essential oils when you feel a cold coming on can help clear out sinuses and the chest, reducing symptoms and helping you make a quick recovery. The best thing you can do is get to know and trust a certain company to source essential oils from. While many oils will claim to be ‘therapeutic grade, ‘pure,’ or ‘food-grade,’ there is very little – if any – regulation, and you can’t always trust these terms to mean much. It is important to remember this especially matters when cooking with essential oils or anything involving consumption, but quality should always be on your mind. Remember: a little bit goes a LONG way! You don’t need to stock up on bottles and bottles to get started. We highly recommend beginning with a starter’s kit or purchasing the oils you know you love. Take a trip to your local health foods store or herb shop to smell the oils, compare prices, and ask questions. These people will have a wealth of knowledge to share, and they’ll also be able to suggest beautifully scented blends you’ll want to use in everything. We hope you learnt a lot about essential oils today! Enjoy this series and enjoy experimenting with your own essential oil infusions, remedies, and relaxation time.